OK. Step one in spending 30 Days With...Ubuntu Linux is to get Ubuntu Linux installed so I can use it. I have already narrowed it down to Ubuntu, so I don't have to bother with the question of which Linux, but the first question I need to address at this point is how to install it. First, there is the "scorched Earth, all-in, leave no survivors" installation. That means wiping my computer clean of all traces of Windows and my existing data--formatting my hard drive, and doing a clean, standalone install of Ubuntu Linux. I am only committing to 30 days up front, so this option is too drastic for my taste. I did consider taking an older laptop that isn't my main Windows 7 laptop and setting up my Ubuntu Linux shop there, but I don't want to have to deal with two laptops. The next option would be to install Ubuntu Linux side by side with Windows in a dual-boot configuration. This option requires making some space on the hard drive so Ubuntu can have its own partition--like emptying out a drawer or two for a girlfriend who is moving in. Well, not only does that endeavor come with some risk of screwing up and losing data, but it also seems like a bigger commitment than I am looking for. 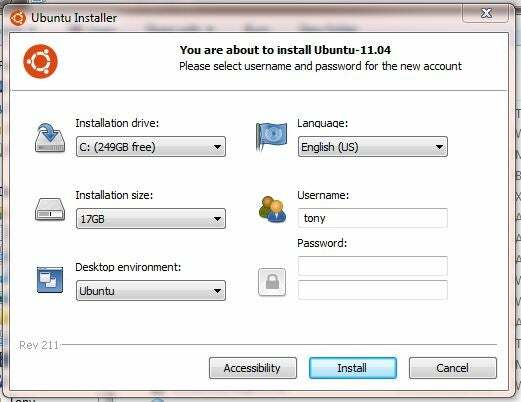 Ubuntu Linux offers a third choice which is perfect for people like me--Windows users who want to install Ubuntu to test it out and see what it's all about. There is an installation utility called Wubi--a cutesy contraction of Windows UBuntu Installer. Wubi lets you install Ubuntu Linux from within Windows as if it were an application, but the result is essentially similar to the dual boot method above. Once installed, you can choose during boot up whether you want to go into the Windows, or Ubuntu OS. There are some tradeoffs to using a Wubi installation rather than a pure dual-boot. A Wikipedia entry on Wubi explains that hibernation is not supported, and the Ubuntu file system is more vulnerable to hard reboots--like simply powering off the system rather than shutting down properly. If Windows experiences a crash, Ubuntu will not be able to boot until Windows has successfully booted and shut down again, and if Windows can't be booted up, the Ubuntu installation is toast as well. There may also be a slight performance hit. But, those are tradeoffs I can live with, so Wubi it is! I pretty much accepted the default installation and moved on. I downloaded and ran the Wubi.exe file, and it worked as promised. I added a password (and confirmed it), and changed the installation size to 30GB--I figure I have the hard drive space, so better to err on the side of too much than too little. I clicked Install, and it installed pretty much like any other software application, with no indication that I was actually installing an alternate operating system. Once it completed the initial phase of the installation, a reboot was required. When the system rebooted, it went into the Ubuntu desktop environment to complete the installation. I have to admit--I am impressed. The Ubuntu desktop interface is pretty clean and simple, with a very familiar look and feel for a Windows user like me. Ubuntu had already installed and configured my wireless adapter, and instantly detected the available wireless networks for me to connect to. A wireless network password later, I was connected to the Internet and ready to rock. The whole process took a matter of minutes. It didn't require me to format or re-partition my hard drive. It didn't require me to understand the inner-workings of Linux. It didn't require anything more than installing any other Windows application, yet I now have Ubuntu Linux installed and up and running. It was amazingly easy. Impressively so. So much so, that I recommend any of you who are curious at all about Linux to go ahead and try it out yourself. You've got nothing to lose. The Windows security blanket is still right there only a reboot away, and if you don't like Ubuntu you can simply uninstall it from the Windows Control Panel like any other application. Day 3: Dude, Where's My iTunes?